Half mountain bike, half endurance road bike, stippled with impressive attention to detail specs such as bar end shifters and fender/rack mounts; the Giramondo know no boundaries. From its beautiful 100% double butted chromoly disc frame to its Shimano Deore mountain drivetrain, it’s easy to see that the Giramondo is the most versatile bike in the Masi arsenal. 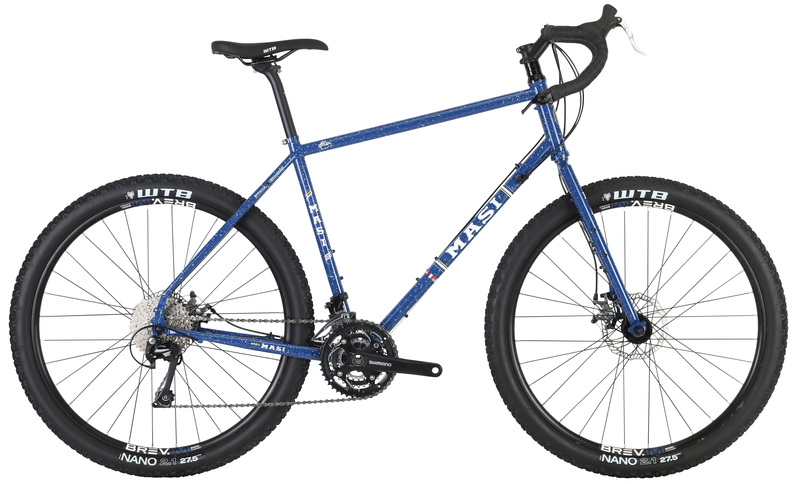 By combining a slacker, more upright geometry with 40c tires, disc brakes, and an expansive gear range, Masi’s Giramondo was bred for loaded off-road distance and adventure riding. The Giramondo’s striking steel frame is strategically outfitted with components that complement its utilitarian temperament. The drivetrain is left to the resilience of Shimano’s Deore 10-speed groupset that includes a triple 44/32/24t crankset that offer no shortage of gears to get you up and over what terrain you cross paths with. Additionally, other than retaining a classic aesthetic, the Microshift bar end shifters offers the perfect combo of simplicity and functionality, while keeping the price point friendly. To keep comfort keen, the Giramondo uses Promax DSK-300R disc brakes for all-weather stopping power, while the Brev. M flared alloy drop bar offers a wider, more natural posture that permits optimal steering leverage and better control.